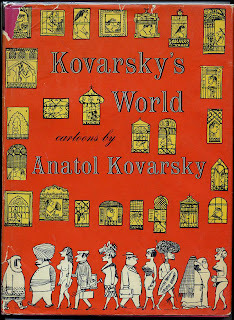 Anatol Kovarsky was a cartoonist for the New Yorker back in the 50s. My parents had this book of his and I can remember looking through it often. I was fascinated by his drawings and the delicate intricacy of his line. He drew people from all over the world and what he brought out in his cartoons was how we all are the same. From the same family. I like the way these people are self contained and at the same time out there.